22 May 2013, 09:09 a.m. The forward-looking outlook for the savvy leaders in the progressive digital media industry is very bright. The mobile owning public is now aware that mobile devices can be used to perform tasks beyond voice and text -- in North America nearly 65 percent of mobile handsets were used to access mobile entertainment services in 2012; 75 percent were used to browse the Internet. In Western Europe the comparable figures were 47 percent and 65 percent respectively. Annual revenue generated from digital content delivered to mobile phones and media tablets is expected to increase by nearly $25 billion over the next three years, reaching $65 billion by 2016, according to the latest market study by Juniper Research. According to the study findings, growth would primarily be fueled by an upsurge in game, video and eBook purchases via tablet devices, allied to increased opportunity for content monetization via DCB (Direct Carrier Billing) on smartphones. Juniper observed that eBooks currently comprise the largest revenue stream on tablets, with eReader applications such as Amazon, Nook and Kobo proving as popular as the respective eReader devices. However, tablets are experiencing a sharp increase in both paid and free video applications, while consumer gaming spend is expected to migrate to tablets from dedicated portable gaming devices such as the Nintendo 3DS and the Sony PS Vita. 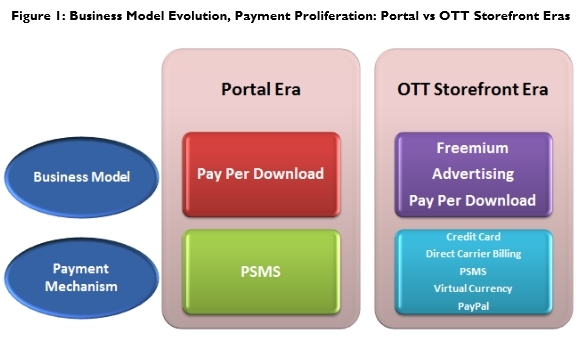 Furthermore, while the primary billing mechanism for OTT (Over The Top) storefronts will remain the credit or debit card, storefronts such as Google Play and BlackBerry App World are increasingly employing direct carrier billing as a complementary monetization mechanism. As Dr Windsor Holden observed, "While the availability of direct carrier billing is patchy, the various benefits which the mechanism offers -- higher conversion rates, opportunities to monetize unbanked customers -- suggest that deployments will rise significantly in the medium term." Music and video now account for nearly half of all mobile content revenues, although the increased video traffic has implications for mobile network capacity. The convergence of the gaming and the social networking spaces has been one of the major drivers behind the post-download monetization opportunity.